Calculating room addition costs can be divided down into two main categories, material costs and labor costs. Material costs – include everything from concrete for the foundation walls to interior trim moulding, and everything in between. Labor costs – are associated with any people you may hire to build your room addition, such as a general contractor or subcontractors. 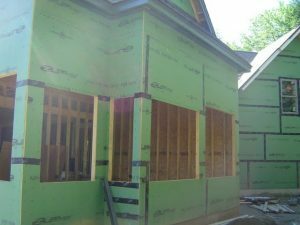 No matter the size of your construction project, calculating room addition costs up front is imperative for determining a budget, pulling building permits, and getting financing if required. 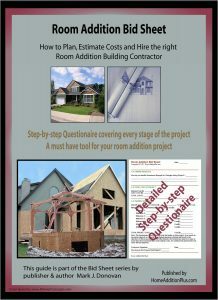 Getting accurate room addition costs estimates is also helpful for determining where to budget money on the project, e.g. in subcontracting more of the work out, or in buying higher-end building materials. On average expect to pay anywhere from $80 to $130 per square foot for room addition costs. The cost per square foot will vary with your local real estate market and contractor labor costs, as well as building materials used. Kitchen and plumbing fixtures are some of the higher ticket items associated with calculating room addition costs. If your room addition includes a kitchen or bathroom expect to pay a higher cost per square foot for the room addition costs. Keep in mind that on a cost per square foot basis that room addition projects cost more than if the living space was constructed originally with the home. This is due for a number of reasons. First there is the simple economy of scale factor. When building a large home overhead costs of construction are amortized over a large square foot area. Secondly, building a room addition involves some demolition and reconstruction of the existing home, such as removing siding from the existing home and cutting into existing roof lines. In addition, new electrical and plumbing requirements of the room addition have to be retrofitted into the home’s existing electrical and plumbing systems. Lastly, if there have been building code changes that have occurred since the home was originally constructed, the building of the room addition may require you to update the rest of the home to the new building codes, e.g. the installation of a fire sprinkler system or new type of circuit breaker. Your local building inspector will make you aware of any of these types of possibilities when applying for your room addition building permit. Key to calculating room addition costs accurately is having dimensional information for every aspect of the room addition. Dimensional information includes not only the square foot size of the addition, but also the length, width, and height of walls, ceilings, cabinets etc. You’ll also need to know quantities, types and sizes of various items. For example, how many light fixtures do you plan to include in your room addition and of what size, type and quality. Every item that you plan to include in the room addition needs to be accounted for and thought out when calculating room addition costs. Besides material and labor costs, there are other room addition costs to be aware of. Often you’ll need to rent a dumpster during the construction of the room addition. 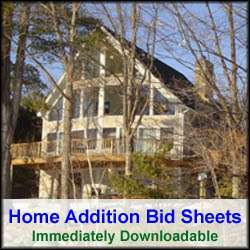 There are also building permit fees associated with building a room addition. You may also require architectural fees and construction liability / material theft insurance fees. Lastly, you’ll want to include in your room addition cost calculations estimates for higher property tax costs, mortgage payments, and home operating costs. Once you’ve calculated room addition costs for the construction and overall operating costs for the new living space you can then decide if building a room addition is something you can afford and want to proceed with. In general, building a room addition is a much cheaper endeavor than selling your existing home and buying a larger one.